The Horse Forum > The Horse Forum Community > Member Journals > My 2 Mares were stars on Trail today! My 2 Mares were stars on Trail today! Today the BM and a couple of other women were heading out to explore some trails that we've recently been given permission to use, and asked if Isabel and I wanted to join. Figuring going out in a group of her pasturemates would be a great way to test the waters, I eagerly said yes- and she was GREAT!! I couldn't be happier. We rode for about an hour, and she encountered a lot. She rode across a big open hay field, through wooded trails, up steep inclines and down the other side, crossed the road (twice), through a parking lot with people honking and waving at us, past someone carrying a giant patio umbrella, and back across a hay field with mowers going and guys throwing tarps over other equipment. Never once did she look at anything funny, balk, shy, nothing. I'm so proud of her! 1. It was hard to hold her back from riding over the horse in front of her. She was pretty happy to be 2nd in line, because the leader was moving at a good pace (this was all walking...), but she didn't like being 3rd or 4th behind the pokier mares. These are all buddies, so it wasn't a problem this time, but obviously not good etiquette. 2. Relatedly, she was very heavy on my hands and was chomping away at the bit (literally) the whole time I was trying to hold her back from riding up on the horse in front of her. I didn't like hauling on her mouth, but I didn't feel like there was much else I could do. So will need a lot of work on that. I'm not sure I'm ready to say I'm 100% confident yet that I can ride her out alone, but it was so wonderful to have this experience today and know that it is pretty reasonable to expect eventually I can get her there. It was just a huge confidence booster all around- and a ton of fun. SOOOOOO much more fun than riding laps around the arena! Can't wait for our next ride! Wallaby, Sharpie, Corporal and 17 others like this. 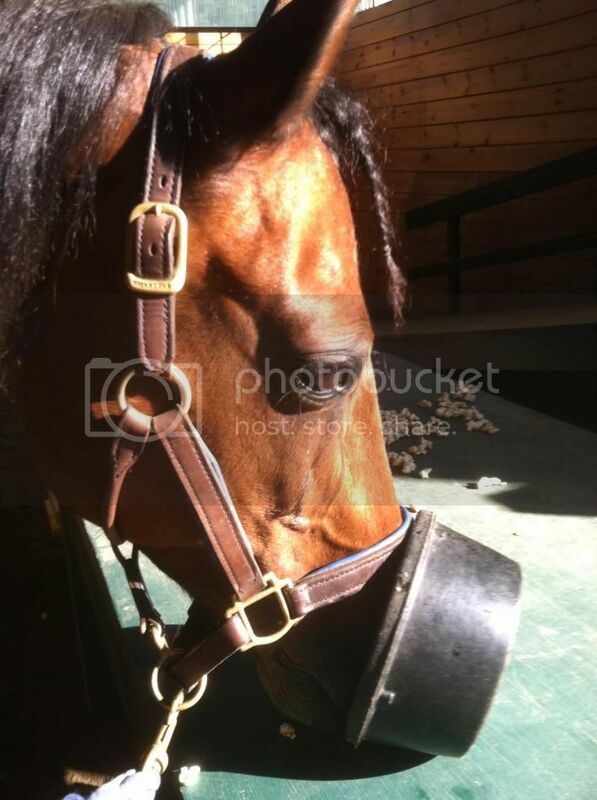 Does your mare behave the same way concerning the bit in the arena, and with other horses in the arena? I'm not sure of her history, but this is just my experience with my horse... he was ridden hard as a barrel horse in his younger years in a HUGE bit. He was with this person from the time he was 2 til 7. 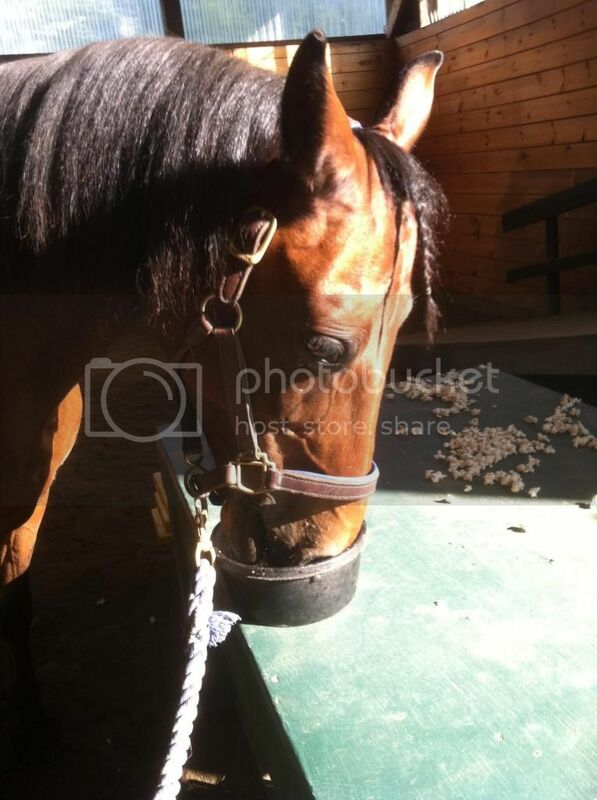 Then his previous owner bought him and had him for 8 months, had him sent to a trainer, and rode him in a D ring snaffle. 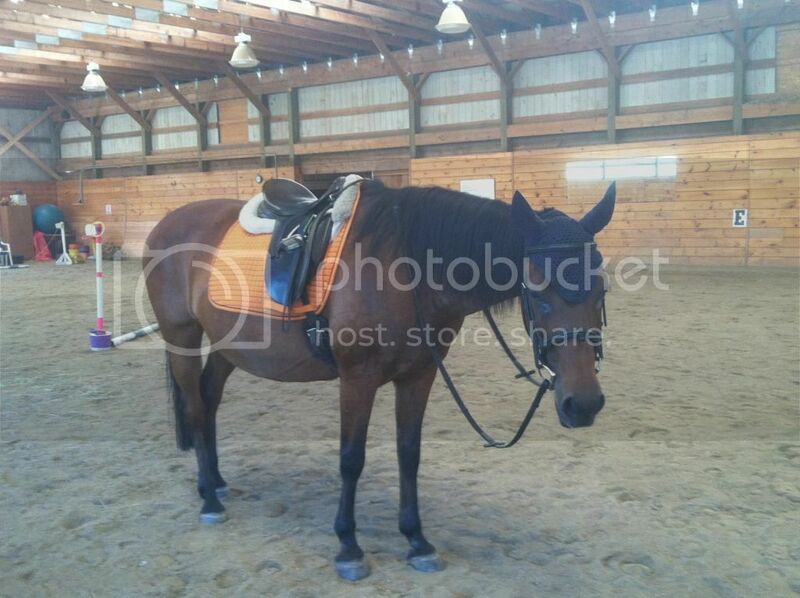 His long time owner was AMAZED he could be ridden, and stopped in a snaffle. I've had him just over a month now, and one day I decided to try him in a side pull in the arena of course... a much different horse. He was so much more relaxed and actually halted and listened to my cues much better than even a snaffle bit. I'm not saying this is the case with every horse but if she is uncomfortable, things are worth trying to see if she is happier! Knave and Moore Norma like this. Anyway, as for the bit, she goes in a simple dee ring snaffle and always has since I've had her. She doesn't usually grab on to the bit in this kind of tug-of-war. She can be a pretty forward little mare, but we don't typically "argue" about it. I think mostly she was just feeling good and excited to be out, which is not necessarily a bad thing. Just want her to be a little more responsive to backing off the horse in front of her. I was happy with her when we headed for home though, she didn't get any worse or any stronger. 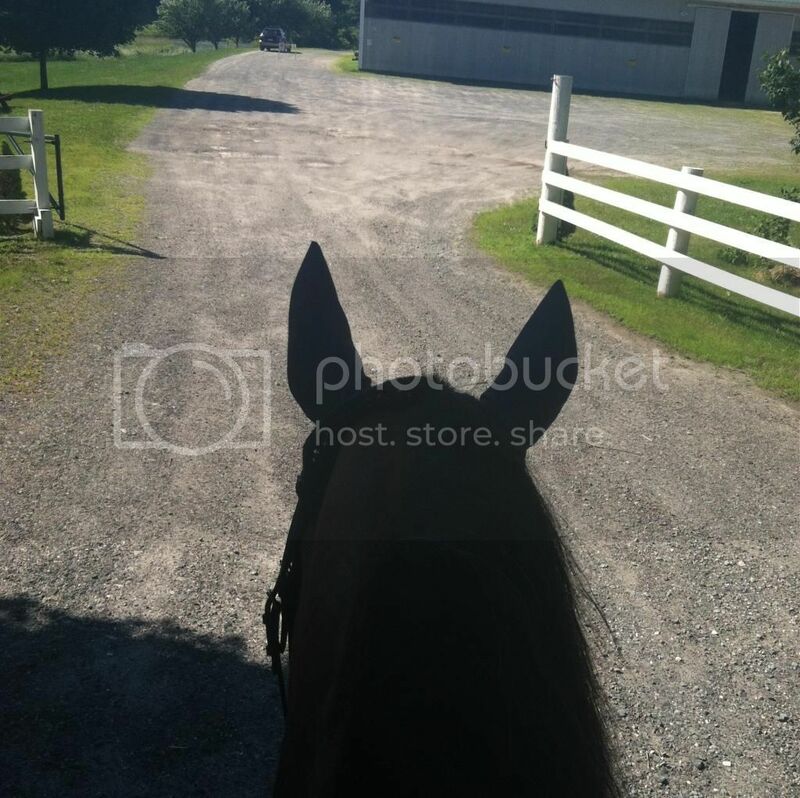 I was able to turn her away from the barn and ride back out down the driveway before making her whoa one last time, and she listened well to that without trying to run for the barn, so I thought that was a positive note to end on. waresbear, Skyseternalangel and Knave like this. 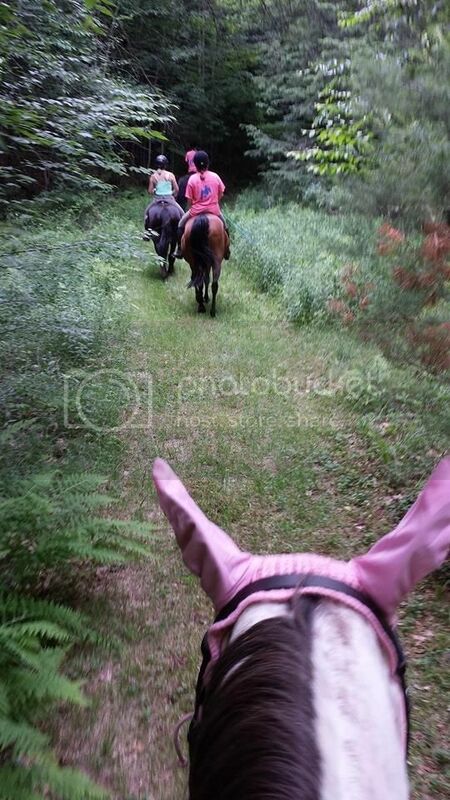 We had a great weekend of trail riding adventures. We started Friday night by actually heading out alone. I was not sure how this would go, as in the past when I've tried to take Izzy out alone, she'll quickly realize no one else is around and start doing this annoying thing where she swings her entire body in one circular motion to try to get pointing home. She doesn't bolt, she doesn't rear, but she just leans her entire weight around so that I can't physically pull her back straight or disengage her hind end to prevent it. -BUT- happy to say, she did not do any of that nonsense at all. We marched down the driveway, crossed the road, and walked calmly across the hay field. Since I know part of the problems with trail riding alone are my own nervousness, I set a pretty modest goal for us- it was simply to ride across the road, across the field, and do a little trotting at an old outdoor sand ring that is probably 1/4 mile, if that, away from the barn. She was so good and calm with that, I decided to actually make things a little more challenging and ride past the ring into the woods on the trail. She was a little more hesitant there, as it had rained pretty hard last week and there were lots of really thick mud spots, which she generally doesn't like. But, she listened, rode as far as I wanted to until we got to a clearing, and then turned around to head back. She was a little quick going home, so we did some circling and changes of direction, but even though her walk was a little jiggy, she was generally ok.
Saturday we went back out with a group, and it's been interesting to see how she does in various positions in line. She definitely likes to be near or on the lead. She did well when she was 1st or 2nd (of 4), but she was miserable when she was 3rd- pulling and pulling so much and running up on the horse in front of her. We really need to work on this, because I couldn't find anything that helped her slow down and back off that horse, and eventually just had to ask to go past. I felt like I was just sawing away at the reins, which I hate. But there was nothing else that would get her to slow down (though hauling on the reins wasn't effective either). I would love advice about getting her more relaxed and responsive when not allowed to be in or near the lead. Finally, a couple of pictures! Treats! 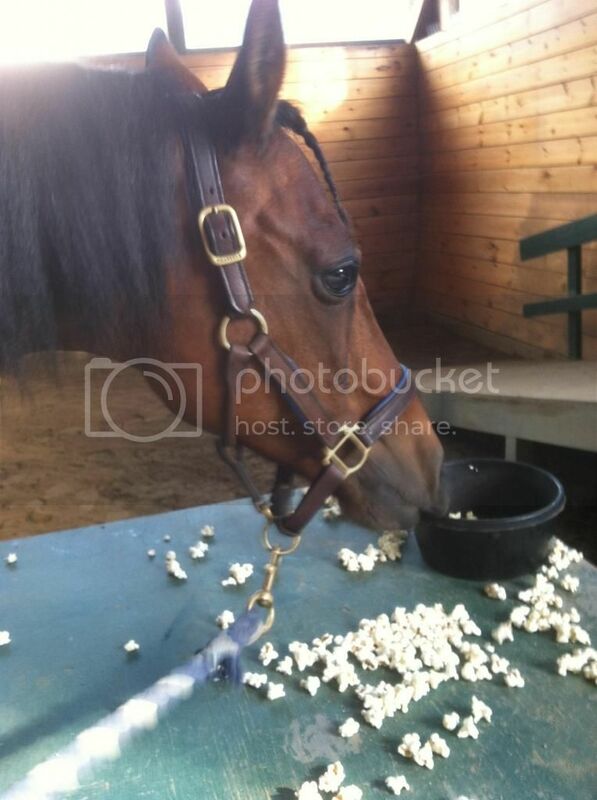 She was helping me take some pictures we would use to promote a "movie night" at the barn, so I got some cute ones of her with her nose in a big bowl of popcorn (get it, horses + popcorn=barn movie night ;)) She wasn't quite sure about the popcorn, but she looked funny playing with it. Wallaby, waresbear, Skyseternalangel and 6 others like this. Had a so-so ride out today. 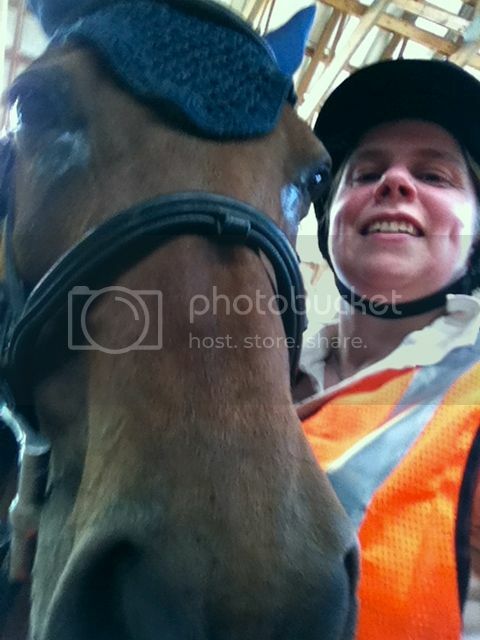 I did my usual 30 minute ride in the arena to warm up, and then headed out. Another horse came into the arena for schooling right as we were walking out, and he started calling to Izzy as we were riding down the driveway. I was impressed that she didn't call back and didn't hesitate walking off the property even with him calling to her. So that was good. We headed across the street, and she gave me a little "I don't really want to do this" pause as we walked through the gate to the big hay field. Still, she went forward with just firm legs, so again, that was good. 1. We are walking straight, and gradually I feel her start to get twisted with the front half of her body. 3. As she gets her head all twisted, she bulges out her right shoulder dramatically and you can feel her really shift her weight to the right (like her energy is really coiled in that front right shoulder). In the PAST, what would happen is that I would try to get her to straighten up by using the right rein to ask her to bring her head back around. I think that was sort of the opening she was looking for, because she'd quickly go from being hyper flexed left to saying, oh thank you for opening that door, you want to pull me right, I'm going to REALLLLLY go right and basically put all my power into spinning around that right shoulder and turning back towards home. She doesn't spin around and bolt, she spins around and continues walking along as though she was asked for a quick turn, which obviously she wasn't. So, I have no idea if this is some kind of evasion move that people could put a name to, but it's really pretty annoying. For whatever reason today, when she tried to do this, my reaction was not to try to pull her around to the right, but rather to keep firm leg on her right side so there was really no way to spin around, and do more of a gradual tickle on the right rein to get her to straighten out. Does that make sense? It seemed to work ok, we never got to the point where she could lurch her body around to head back home. But curious if anyone has any thoughts about this and what I could do? The footing was really terrible as we've gotten drenching rain the past couple of days, so I didn't really do much more than ride the perimeter of the hay field, but it's been great to have these short outings alone to continue to build confidence. At the end of the ride when we do turn around to head back, I don't like that she's still so fixated on getting home that she gets really prancy at the walk, but so far she does listen enough to technically stay at the walk. I make it a point not to just ride a straight line home, we do lots of loops and circling around bushes or other random objects. It seems to make her pretty annoyed, but I feel like right now it's a level of "annoyed" that I can still make my point and be safe doing it. Any other tips? Wallaby, Sharpie, Skyseternalangel and 4 others like this. Lacey would do the same thing!! With her, the trick ended up being just riding her forward. Giving her a solid kick [or a smack with the crop if a kick didn't work] seemed to do the trick if she managed to get her head around. Of course, there were sticky spots [she had specific spots where she believed we "needed" to head home] but I realized that mostly it was MY fault. I'd get so "oh this is a lovely trail!" and she'd do her head thing as a sort of "hey! I'm here too, buddy!" If I stayed conscious as a rider, kept her impulsion up, I found she would rarely even try. The minute I let her get ploddy, the more she'd start taking charge of the ride and swing her head around. With the trying to lead/getting prancy, if she's anything like Lacey, it's just her inexperience showing. Lacey felt safest when she was leading so, as a green trail horse, I generally let her lead [I suppose it's something like being backseat driver? haha She wasn't sure the horse in front could handle whatever might happen, but she knew she could handle it better. ] since she was a perfect ride in the lead and the people I'd generally ride with loved not having to worry about leading. As she gained more experience on the trail, she became fine anywhere in line - no fighting [actually, she got SO comfortable that getting her going, in company, became an issue hahaha]. My only guess is that, at first, she wanted to see the scary stuff first and didn't like feeling blocked in. Later on, she realized that she wasn't missing much so she might as well take the easy job. 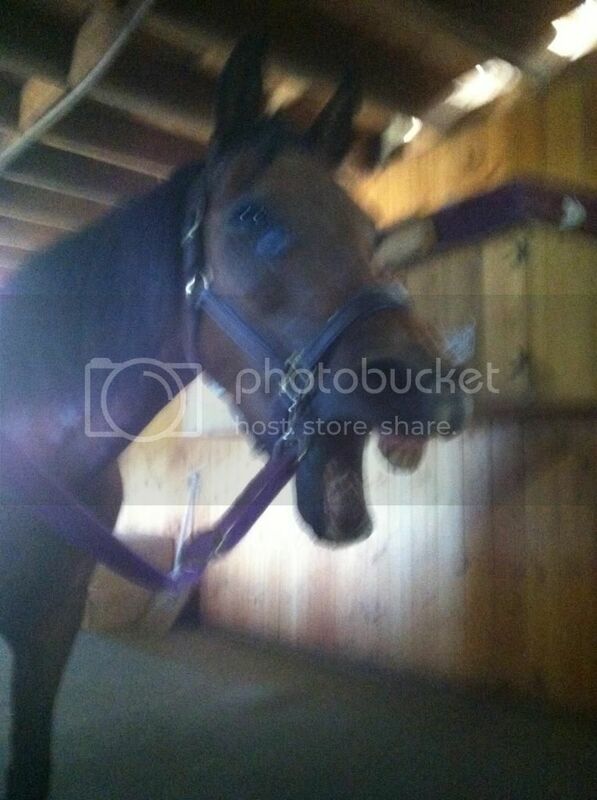 egrogan, SoldOnGaited, LincolnNC and 1 others like this. Can I just say she's GORGEOUS? farahmay and Knave like this. This is really helpful! I think because I've been a bit nervous about riding out of the ring, working on letting myself be calm, and "enjoy the ride"- I could very well be so focused on myself that I am sort of ignoring the fact that I actually have to ride. I will check on this next time! Skyseternalangel, Knave and Moore Norma like this. Knave and WildRoses like this. Big day guys, we went on an honest-to-goodness solo ride today. It was a gorgeous, sunny day, it was just too good to pass up. We have a 45 minute trail loop that has some nice hills, some nice woods, and some easy turnaround spots, so I figured it was time to try. It was a bit nerve-wracking in the beginning, we need to ride about 1/4 mile on the road to get to the trail. It's a twisty, country road and people don't tend to respect the speed limit or Horse Crossing signs. However, a very nice woman did see us and slow down plenty- problem was, she slowed down to a creep and wouldn't pass us at all, which was freaking me out. So, I asked Izzy for a trot, she moved forward smartly and I was able to "park" on the shoulder of the road for the lady to go by. Of course when we stopped about 200 feet from the barn driveway, Izzy thought about trying her whole spin-towards-home move, but we successfully got going forward again. I really focused on keeping her moving forward, riding along rather than sightseeing, and keeping her mind busy. At first she was a little gawky, but she settled right down, gave me a couple of nice big sighs, and was a very good girl! I will probably look back at this in the future and think it was silly to feel so invigorated about walking a couple miles on an easy trail, but I have to say, I just really feel like we accomplished something! I honestly never knew if we would be able to ride like this, and it just feels so great! Next step: Begin to build in some trotting and cantering in some of the nice open stretches on the trail. ChristineNJ, Skyseternalangel, Knave and 1 others like this.